North Cascades National Park - A True Wilderness Experience - Just Get Outdoors Adventure Travel 865-977-HIKE(4453) provides Naturalist Guide Service, Customized Guided Hikes, Interpretive Walks, Hiking Vacations, Backpacking Trips, and Adventure Travel in the Smoky Mountains and other Nature Destinations throughout the United States, Environmental Education, Family Programs, Birdwatching, and Nature Photography Workshops. Remote! Magnificent! Wild! Vast! Rugged Beauty! These are just a few of the adjectives used to describe North Cascades National Park, and yet they only hint at the incredible nature of this portion of the expansive Cascade Range. Venturing into North Cascades National Park is a wilderness experience par excellence! This trip will provide an opportunity for you to explore a very remote national park and ecosystem – an area not accessed by most people; in fact, due to its remoteness, North Cascades National Park is the second least visited national park in America. Join me on this unique adventure and enter a world of stunning natural splendor. North Cascades National Park is one of the wildest places in the United States! Established in 1968, this 684,000-acre park is nestled in the heart of 7 million acres of protected public lands in Washington and British Columbia. North Cascades National Park and the Ross Lake and Lake Chelan National Recreation Areas make up the North Cascades National Park Service Complex and form the core of one of the largest and wildest wilderness areas in the contiguous United States. In 1988 Congress designated 94 percent of these parklands for protection as the Stephen Mather Wilderness. The Park is known for its steep mountains with high jagged peaks, ever-flowing streams, countless cascading waterfalls, and tremendous biological diversity. East and west of the Pacific Crest, several major watersheds flow from the North Cascades, including the Skagit River, the largest basin draining into Puget Sound. With more than 300 glaciers and countless snowfields, the Park is one of the most rugged and heavily glaciated areas in the United States outside of Alaska! Plant life in the North Cascades is very diverse with eight distinctive life zones supporting more than 1627 vascular plant species. North Cascades National Park is considered to be one of the most vegetationally diverse parks in North America and includes 236,000 acres of remarkably lush old-growth forest. Wildlife is abundant as well with 75 mammalian species (including gray wolf, wolverine and fisher), 21 species of reptiles and amphibians, approximately 200 species of birds (including Bald Eagle and Harlequin Duck), and 28 species of fish (including five species of native salmon). Culturally rich as well, Native American culture has existed here for more than 8,000 years! The North Cascades were home to many Native American tribes and a trade gateway between the Columbia Plateau tribes to the east and the Coast Salish tribes to the west. There are 386 miles of maintained trails, many taking you to absolutely breathtaking alpine scenery, along with waterfalls, alpine wildflowers, abundant wildlife, and the turquoise waters of glacial rivers and subalpine lakes. The North Cascades Scenic Highway will take us into the heart of the Cascades and through what has long been known as the “North American Alps.” Considered to be one of the nation’s most spectacular mountain drives, it is the main road through North Cascades National Park and provides the northernmost cross-Cascades route, crossing 4860-foot Rainy Pass and 5477-foot Washington Pass. The remoteness of this park is underscored by the fact that a stretch of this road is closed from mid-November through April, due to winter snows. The only other way to reach the heart of the northern Cascades is by seaplane or boat up the narrow, fjord-like Lake Chelan, the third deepest lake in America. And this is exactly what we will do – travel by ferry into this remote wilderness. As we progress up this 50-mile long lake and into the Lake Chelan-Sawtooth Wilderness Area, the scenery will grow more spectacular around each bend. The sheer mountain walls rise to nearly 8000 feet in the saw-toothed crest of the Cascades. 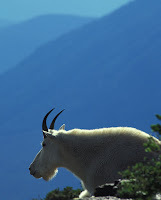 As we make our way to the remote village of Stehekin and Lake Chelan’s headwaters, we will be ever watchful for mountain goats, bear, bighorn sheep, and a variety of birds. There is no better way to experience such a remote, wild, and extraordinary region than by hiking the trails and spending time on the lakes. And this, my friends, is exactly what we’ll do. On this naturalist-led trip, we will hike a variety of trails, do a little paddling, take a 3-hour ferry ride, and be thrilled by new sights and sounds along the way. We will explore the natural history and geology of the “North American Alps,” learning about the wildlife and plant life adapted to living in this varied, remote, and sometimes harsh landscape. As we travel the trails, we will investigate whatever crosses our path and catches our interest. This will include anything from birds, mammals, and other wildlife to wildflowers and other plants, as well as animal tracks and traces. My hope for all of us is that the memory of this northwestern adventure will be one we can recall throughout our lifetimes, with great fondness and continued amazement and wonder. Generally, the best time for visiting the North Cascades is between mid-June and late-September. Snow is usually off all but the highest trails by sometime in July, making August a premier time to explore the North Cascades. We’ll have access to both the low and high country, a must to fully experience this magnificent area and its flora and fauna. We should be treated to a nice variety of wildflowers at various elevations. We will share the trails with other visitors; however, overall visitation in this national park is quite low, designating this park as the second least visited park in the continental United States. Because mountain weather is unpredictable and prone to sudden changes, you must be prepared for a wide range of weather conditions. Though May through October experiences the lowest average rainfall, summer storms are common so always be prepared for a few days of rain and wind. Warm layers and waterproof clothing are all but required year-round. Daytime temperatures will vary with our elevation and location within the Park. The east side of the Cascade Mountains (such as Stehekin in Lake Chelan National Recreation Area) is drier and warmer in the summer than the west side (such as the portion of Ross Lake National Recreation Area along the North Cascades Highway). Summer temperatures at Stehekin can reach the 90's (F) while the temperatures at the higher elevations and on the west side will be cooler, with highs in the 70’s and 80’s. Weather data gathered in Newhalem, Washington (West side of park), near North Cascades Institute. *Temperatures are in degrees Fahrenheit. For more detailed weather information visit www.weather.com. Exploring and hiking in one of the most remote and least-visited national parks; a wilderness experience; natural history interpretation; stunning, dramatic, incomparable scenery; photography; tremendous biological diversity; birding; wildlife viewing; botanizing; alpine wildflowers; more than 300 glaciers; waterfalls; kayaking on Lake Chelan; lodging inside the park; staying at the Stehekin Valley Ranch in the spectacular and remote Stehekin Valley and the North Cascades Institute on the shore of Diablo Lake and in the heart of the North Cascades; Ferry ride up fjord-like Lake Chelan.